The skills school group at Manor Park have created a map of their school and surrounding community. The map shows all the places children go to and the different people that use those places. The children spoke about the places they like in the school and where they live. They also added things in that aren’t as good and they would like to change. 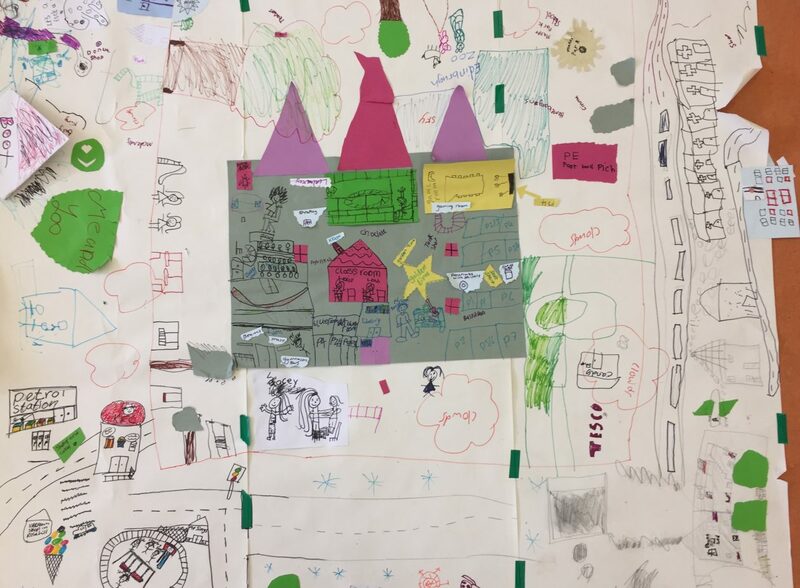 There was also time for the children to use their imagination and add things to the map that would make the school and area the best place for children to be and to learn. The Manor Park Parliament will be sharing their work and ideas with adults soon. The skills school children made a list of adults they would like to invite, including teachers, the police, PSA’s, the management team, the janitor and office staff. “Join us, you are invited! Children’s Parliament is a place where kids speak freely. We share our emotions and have fun! We help Manor Park School be a kind place and do things to make the school and playground better. It feels important to be in the Manor Park Parliament. For 2019, the children of Manor Park Parliament have come up with ideas for new year’s resolutions for the pupils and staff at their school. Will you choose any of these resolutions for 2019 and beyond? Posted on December 29, 2018 January 7, 2019 Categories Imagining Manor ParkLeave a comment on New Year Resolutions! The Skills School group discussed what might get in the way of a child being happy in the lead up to Christmas and what is so great about the festive period. A learn-o-meter is a special tool that shows what helps with learning and what can get in the way. The skills school children created one for Manor Park School. The Skills School group were asked to think about where they learn at Manor Park School. In groups they explored the school and thought about how different parts of the school made them feel and helped with their learning. The children went to their classrooms, the gym hall, the library and the playground and took photos with different coloured dots depending on if the place is somewhere that helps them to learn, makes them feel calm, is somewhere they like to be, or a place that they would like to change. Afterwards the group came back together to share their experiences of different places they learn in at Manor Park. They thought about what could be better and came up with some solutions to things that get in the way of learning at school. This is the Learning and Teaching group. Here are their thoughts on how they have their say about their learning at Manor Park.